A history scholar at The University of Toledo has been awarded a fellowship from the National Endowment for the Humanities (NEH) that will allow her to spend the 2019-20 academic year writing the history of Mary Willing Byrd, one of the few women who ran a large plantation in the early American South. Determined to track down and shine a light on Byrd’s story, Pflugrad-Jackisch spent nearly a decade unearthing a paper trail of letters, court cases, and property records and records. Her archival quest took her to Virginia, Indiana, Pennsylvania, Rhode Island and Michigan. 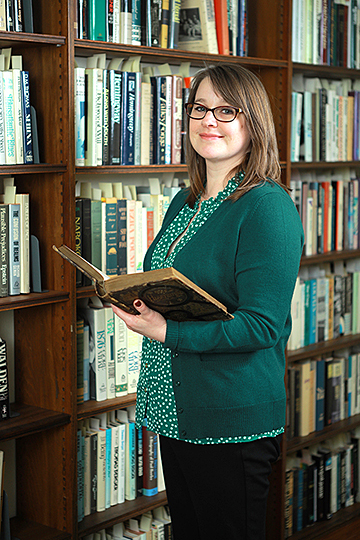 Pflugrad-Jackisch received one of 84 fellowships announced by the NEH totaling $4.6 million. The NEH, an independent federal agency created in 1965, works to serve and strengthen the country and convey the lessons of history by awarding grants for top-rated proposals examined by panels of independent, external reviewers. In her manuscript, Pflugrad-Jackisch makes use of Byrd’s correspondence to Thomas Jefferson and high-ranking military officials during the Revolutionary War, including the Marquis de Lafayette. These letters demand the return of escaped slaves and compensation for property lost when the British army under the command of the traitor Benedict Arnold raided her plantation along the James River, damaging all of her farming equipment. In her role as manager of Westover plantation, Byrd directed the labor of more than 100 slaves; supervised the plantation’s overseers; sold wheat, barley, corn and tobacco crops; and fended off her late husband’s creditors in court. Her interactions with the state, military and market were out of the ordinary for a woman during that tumultuous time of upheaval. Pflugrad-Jackisch’s first book, “Brothers of a Vow: Secret Fraternal Organizations and the Transformation of White Male Culture in Antebellum Virginia,” was published in 2010 by the University of Georgia Press. This entry was posted on Thursday, February 7th, 2019 at 3:51 am and is filed under Arts and Letters, News, Research, UToday .